In the morning, we are heading to Shanghai Urban Planning Exhibition Hall, which shows the achievement of Shanghai city planning and construction. Then take a visit to Shanghai World Financial Center, the highest building in Shanghai. Afternoon we are going to Yuyuan Garden which represents the delicate garden art of south China classical gardens . Move to Silk Factory before soaking in the Bund for amazing river and city views. After western breakfast at hotel, drive to Zhouzhuang where we will take a pleasant cruise in the water town. 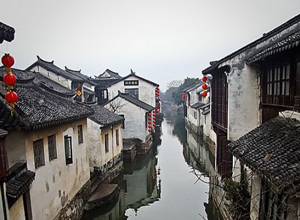 The crisscrossing rivers and the distinctive folk cultures and customs have formed the unique charm of the water towns in Jiangnan area. Transfer back to Shanghai. In the morning, we are heading to Shanghai Urban Planning Exhibition Hall, which shows the achievement of Shanghai city planning and construction. Then take a visit to Shanghai World Financial Center, the highest building in Shanghai. Afternoon we are going to Yuyuan Garden. Move to Silk Factory, soak in the Bund. After western breakfast at hotel, we are driving to Zhouzhuang and take cruise in water Town. The crisscrossing rivers and the distinctive folk cultures and customs have formed the unique charm of the water towns in Jiangnan area. Transfer back to Shanghai. Hi! How much does the tour cost?